A parliamentary report of 1777 recorded parish workhouses in operation at Tavistock (for up to 50 inmates), Lifton (50), and Staverton (30). 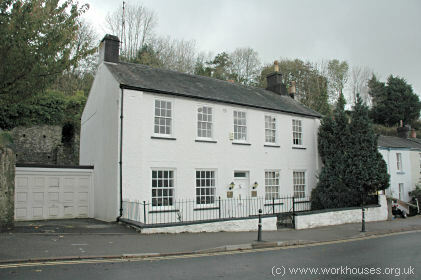 Tavistock had a workhouse from around 1741 (Hitchcock, 1985). A site at the west of the town off what is now Maudlins Lane is shown as the "Old Workhouse" on the 1884 map below. Tavistock Old Workhouse site, 1884. The old workhouse building has now been converted to residential use. 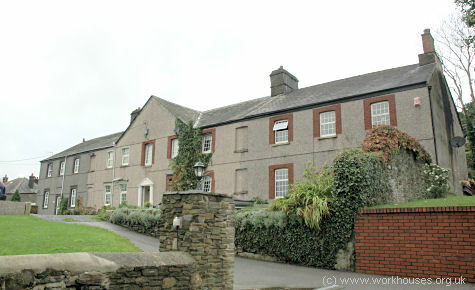 Tavistock former parish workhouse from the south-east, 2005. Devon: Beer Ferris (3), Bradstone, Brentor, Buckland Monachorum (2), Coryton, Dunterton, Kelly, Lamerton (2), Lewtrenchard, Lifton (3), Lydford (including Dartmoor), Mary Stow, Mary Tavy (2), Meavy, Milton Abbott (2), Peter Tavy, Sampford Spiney, Sheepstor, Sydenham Damarel, Stowford, Tavistock (5), Thrushelton, Walkhampton, Whitchurch. Later addition: Tavistock Hamlets (from 1898). The population falling within the Union at the 1831 census had been 20,630 — ranging from Brentor (population 147) to Tavistock itself (5,602). The average annual poor-rate expenditure for the period 1834-36 had been £8,547 or 8s.3d. per head of the population. Tavistock general view from the south-east, 2001. Tavistock followed Scott and Moffatt's typical design. At the south of the site was a single-storey front block with a central entrance archway. This block would probably have contained a porter's lodge, Guardians' board room, clerk's office and so on. Tavistock entrance block from the south, 2001. To the rear was the three storey main accommodation block. The master and matron's quarters would have been at the centre, with sections for the different classes of inmates to each side. The area between the entrance and blocks was contained walls to create exercise yards. Tavistock lodge and workshops from the north, 2001. An infirmary block stood at the north of the site. After 1930, the establishment was taken over by Devonshire County Council and became a Public Assistance Institution later known as Gwynntor Welfare Institution. The Tavistock Union a home for 24 childreen at 33 West Street, Tavistock. Tavistock West Street children's home, 2005. A second home at Gunnislake could accommodate 16 children. Devon Heritage Centre, Great Moor House, Bittern Road, Sowton Exeter EX2 7NL. Holdings include: Births (1866-1945); Deaths (1866-1919); Creed register (1868-75, 1879-90, 1914-32); Punishment book (1914-48); etc.